Hello again. I realize I haven’t posted in awhile, between rewriting the first chapters of the new novel and hosting Maurizio’s mother, brother and niece (more on our adventures in the next post). But I want to share a beautiful iceberg with you. Happened this way. Some years ago, when I was between colleges and living in New York, I worked in the Rockefeller Foundation reference library, checking out credentials of the many scholars who wanted grants (not the absolute lunatics who wanted money — they got a form response). In the next department was my new friend Judith Appleton, a fine photographer and artist who generously and vainly tried to get me involved in the visual arts — drawing, block print, silk screen — for all of which I had no talent at all. Later I moved to Ohio, she to Israel and we lost touch. Just recently, through the power of internet, I found Judith in Jerusalem, doing wonderful landscape art. 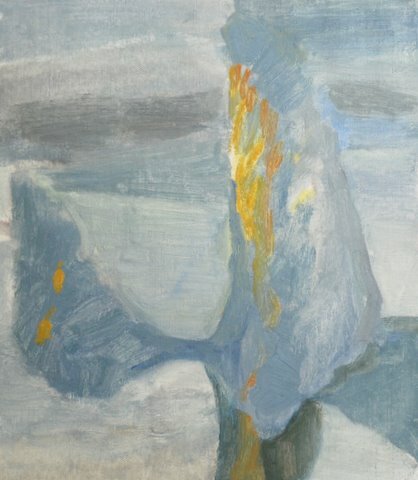 Recently she took a painting vacation in north Greenland (doesn’t everybody?) and shared this beautiful and evocative work, part of an iceberg series. So I share it with you.